Lord Buddha‘s life has many miraculous incidents right from how he was born and what happened from then till he left this earthly abode. It is believed that immediately after he was born he took seven steps to the north and uttered a few words about his birth being his last one, and wherever he stepped a lotus flower bloomed ! His birth too was via a dream his mother Mayadevi saw of a white elephant. He was born in Lumbini grove in Nepal, from Queen Maya’s side . Birth of Buddha,Gandhara, 2nd-3rd century. Siddhartha Gautama attained enlightenment and became the Buddha. His cousin was Devadatta who was also the brother of Ananda, a chief disciple of Buddha. Devadatta too was abuddhist monk but parted ways with the Buddha with 500 monks. He started a sangha of his own and gained some psychic powers. However he was against the Buddha and wanted him to retire. Buddha was against this; Devadatta plotted with Prince Ajatashatru to kill him. But the mercenaries who came to kill him (who were again ordered to be killed by others) were unable to carry out the task and got converted instead. Devadatta even lets loose an intoxicated elephant Nalagiri to trample the Buddha. But the elephant gets tamed totally owing to the Buddha’s loving-kindness and bows down before him ! Nalagiri, elephant charging at the Buddha,painting,Wat Phra Yuen,Thailand. Nalagiri bowing to the Buddha,painting. The miracles of the Buddha are many and have been depicted in sculpture and paintings. He spent many of his monastic years in Shravasti,in present day Uttar Pradesh. 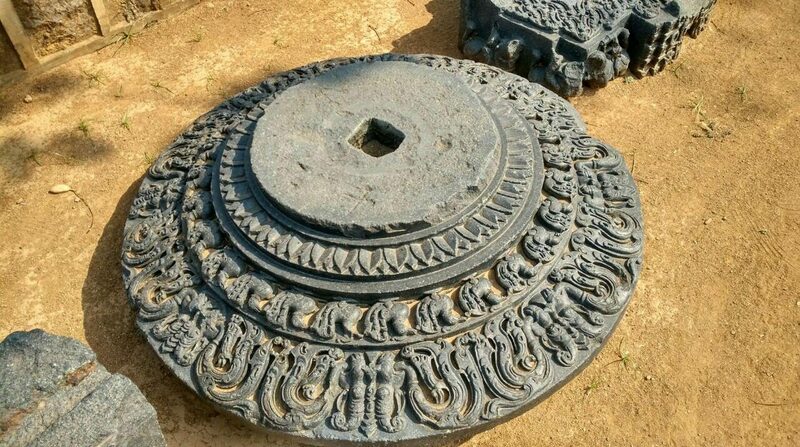 It was the capital city of Kosala, in ancient India. Shravasti was on the banks of Achiravati,now called as Rapti river. He had visited this place on the invitation of Anathapindika. He had performed the twin miracle of producing contradictory elements; flames from the upper part of his body and water from the lower. He also could multiply his body supernaturally. He performed a series of miracles at Shravasti. Site of the Twin Miracle, performed by Buddha in Shravasti. The sculptural depiction below in gray schist depicts Buddha standing on a pedestal with an altar, flanked by seated Buddhas and their attendants. The Buddha’s robe falls elegantly on his body , his hair secured in an ushnisha and flames are seen emanating from his shoulders and water from his feet. Miracle of Shravasti ,2nd-3rd century,Gandhara. Buddha multiplying his body,painting, Astasahasrika Prajnaparamita Sutra manuscript, 700-1100 A.D,Nalanda, Bihar. By Asia Society created the file. Artwork created by an anonymous ancient source. [Public domain], via Wikimedia Commons. The Buddha’s miracles included, purifying water, power over nature , walking on water,travelling through space, make himself as big as a giant, and small as an ant, walk through mountains, dive in and out of the earth,allowing people to read each other’s mind and spreading a cleansing light throughout the world. His miracles resulted in the conversion of the Kasyapas’ ninety-thousand followers. The sculpture below again depicts the Buddha performing his twin miracle. Flames rise from his shoulders, and water flows through his feet. The twin miracle, 3rd century, Gandhara, Museum für Indische Kunst Dahlem, Berlin. This entry was posted in asian art, Buddha, Buddhist art, Miracles and tagged Buddha, Buddhist art, Miracles on March 23, 2017 by historyreads.